By Fahad Khan in Social Media. Updated on November 19, 2017 . Social media is a useful method for any person out there to to take the marketing up a notch. Twitter is one option if you’d like to do this but sometimes it can get a bit complicated trying to figure out what works and what doesn’t. Recently, Twitter released Twitter Analytics to help us with that little problem. It’s got some basic functions and tools but there are also others that can be used to examine the performance of a Twitter account. These websites can do a lot of things such as provide you with a score, generate graphs, and much more. Have a look at 5 of these useful tools that you can utilize to help you scrutinize and examine the performance of your Twitter account. Twitter counter is one site that requires you to tie your Twitter account to their app but don’t worry as it’s safe to do so. Some of the freetools that make it different from Twitter Analytics are the Twitter Widget that informs you who visits your blog or site as well as Profile Checker that allows you to check and diagnose your Twitter account and gives some helpful tips to become more successful on the Twitter’s network. There’s also the Top 100 Twitter Users feature which shows you the list of top 100 Twitter users based on either their number of tweets, followers or people who follow them. The Twitter Counter API allows a person to retrieve each and every piece of information Twitter Counter knows about a certain username. PeerIndex provides social media analytics including something called the “Topic Fingerprint” which is a unique feature. It is a graph that illustrates what kinds of topics you have tweeted about. Users also attain a PeerIndex rank which is based on three components that are Authority, Audience and Activity. PeerIndex offers Trend Alerts and Track Communities which provides insight into what’s trending and helps you get more insight about your audience. You can also Discover Content and see what’s popular and what’s being shared within the Twitter community. Another feature of PeerIndex is Search Influencers which permits you to search for influencers within communities or across Twitter. Track Lists helps you track those you want to keep track off, such as your competition, while the Reporting & Analysis feature can help you monitor, measure and compare your performance against that competitor. Tweetails is a free service provided by MEMSET. It is a great tool for Twitter users to calculate statistics from their tweets or anyone else’s tweets. It lets you find out the most mentioned users by your Twitter account, your most favorite words, gives you intelligence ratings and etc. The statistics calculated by Tweetails for a Twitter account are based on various factors, one of them being the most recent 1,000 tweets posted by the account, which is then analyzed. The Intelligence rating of a user is calculated on the basis of factors such as unique content on a user’s feed, vocabulary diversity, and syllables per words among other things. As mentioned, Twitter has recently launched their own way of being able to analyze your Twitter account. It’s not just available specifically for businesses but for basically anyone with a Twitter account. Twitonomy is a very useful analytics tool for getting details and visual analytics about a Twitter account. It permits you to get insight on the people you follow and those who follow you. 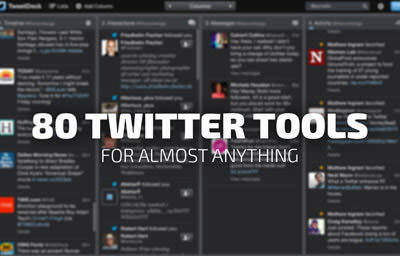 It also allows you to monitor tweets and keywords searched from your favorite users. These are just some of the tools that can provide you with the information that you need to help develop the strategy of your Twitter account. All it takes is for you to decide what works for you and what doesn’t and that will help pave the way for you to really make full use of Twitter and its marketing applications.